Remember the time you were walking through that sketchy and dimly-lit area of campus and had to use your phone’s flashlight app? What about when you went downtown on Saturday night and no one walked you back to your car that was parked alone in a drab lot or parking garage? It doesn’t take much for a city to feel unsafe, and anyone can tell when a city is unloved. Yet over the past couple decades public art displays have made a comeback in cities all across the United States in an effort to make residents feel more comfortable and happy. One of the figures leading this artistic charge is Bill FitzGibbons, a large-scale sculpture and LED light artist from San Antonio, Texas. Since the 1970s, FitzGibbons has made it his life’s purpose to improve others’ quality of life within cities such as Birmingham, Alabama; San Antonio, Texas; Anchorage, Alaska; and Providence, Rhode Island by installing public works of art. Bill’s work has become synonymous with many people’s daily lives inside the cities he has had an impact on. His “Rhode Island Lights” display made up of red-lit neon lights scattered across the top floor of a convention center parking garage is as well-known a sight in the Providence area as their state license plate image. Completed back in 1996, this artwork has even been incorporated into flags and promotional material for the city. When most of us think of art these days the feeling that comes to mind is generally an over-air-conditioned museum with paintings hanging on a whitewashed wall being chaperoned by “DO NOT TOUCH” signs every three feet. Bill’s LightRails project, located in Birmingham, Alabama, was just recently completed this past summer and consists of perfectly placed multi-colored LED lights within an underpass that would otherwise be a dark often dangerous void into which only cars would dare go. This project, along with Light Channels in San Antonio, Texas; is such an easy and uplifting fix to any city that could use a facelift without the expense of costly construction projects. Although much of his artwork is permanent, such as the Millennium Plaza piece at the University of Houston at Victoria and SkyWall located in the international arrivals terminal at Bush Intercontinental Airport, some of Bill’s most memorable and successful projects are not meant to last forever. 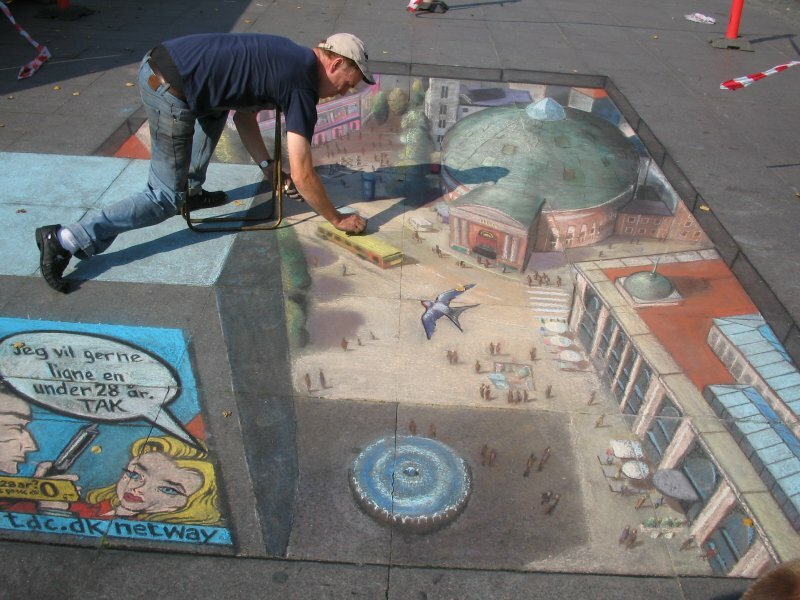 Just as chalk artist Julian Beever must understand the beauty of non-permanent art, Bill has also created complex light shows that will forever be one night stands. Enter now the historic Alamo in San Antonio, Texas. Coordinating with the San Antonio Symphony Orchestra, FitzGibbons orchestrated a first-of-its-kind light show for San Antonio’s inaugural Luminaria arts night. While the display had no permanent intentions, it instilled a noted sense of pride and appreciation among the crowd and people of the city. Cities around the U.S. are actively trying to seek more environmentally friendly ways of life. For most metropolitan areas this environmental movement means creating more green space, public parks and meeting grounds for residents to enjoy and seek refuge from the stresses of our daily lives. “I’m a big proponent of using a green approach in art,” Bill says, telling me that one monumental project, Daystar Plaza at San Antonio’s International Airport, even involved using reclaimed B.A.C. 1-11 airplane wings. Unfortunately the cost of upkeep for public art, especially art exposed to the outside elements, often comes at a hefty price. “One of the biggest problems in public art is how to continually fund these public works,” Bill explains. Upkeep of these projects is one of the major issues surrounding the increasing demand for public art across the country. If treated poorly, the costs to repair or refurbish a piece can be expensive. One solution would be to inform city workers on how to properly clean or, if necessary, paint the objects. Otherwise, Bill says, the artist themselves need to travel to the area to do the upkeep. “I know someone whose work needed repainting and the groundskeeper had left over orange paint lying around… It wasn’t supposed to be orange,” he joked. But rest assured, there is a bright, colorful and hopefully not so orange future for public art in U.S. cities. There seems to be a sudden and renewed awakening surrounding the importance of art and culture in our daily lives as we rediscover the potential it has to improve an otherwise drab urban environment. “Take an object…as mundane as an underpass, it can be transformed into something that people want their wedding pictures taken in.” It’s moments like these that public artists live for because these places remain in their and others memories as something to cherish. FitzGibbons delivered some advice for aspiring new artists and art school graduates as well who are asking themselves the same question: Now what? The implementation of more public art in our urban centers will hopefully encourage city-goers to feel more at home in the place that they already live in. In order to help the effort in your city, be sure to support local artists, art institutes and universities because they are the ones who can make our cities vibrant and wonderful again. Born and raised in Rochester, NY, a graduate of St. Lawrence University with a passion for the sport of rowing. A current rowing coach, avid hiker and skier with the lifetime goal of sampling every beer ever made.